Skip is a 13 year active duty US Army Veteran. Skip was at Fort Lewis in Washington training on 9/11. The world changed that day. 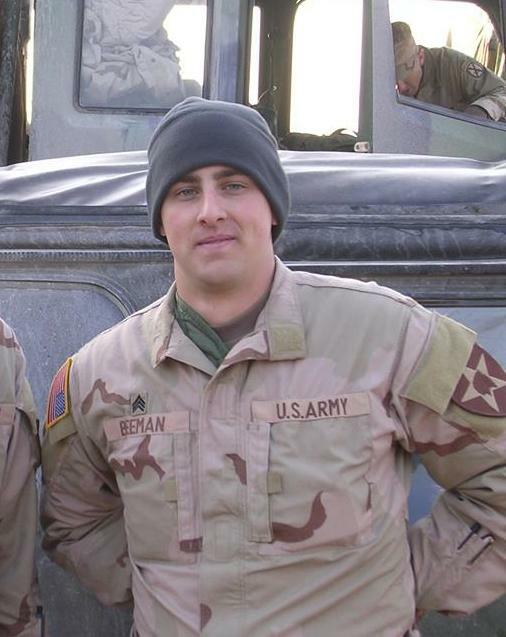 Within a week his unit had unofficial word that they were going to Iraq and his unit was sent to Fort Irwin in California to train for action. Shortly after his unit was in Kuwait offloading their vehicles and heading to Baghdad, Iraq. They had been inserted so quickly, without time to properly outfit the vehicles, many of the vehicles did not have appropriate armor. In late summer of 2003 they were in Balad, in the heart of the "Sunni Triangle" running patrols, recon, and capture/kill missions. They were mortared, shot at with rockets and small arms on a daily basis. They spoke little to no Arabic, so translators were obtained from the local population. They had to hope the translators were "good guys" and that their translations were accurate. Translators were often killed by beheading and their heads were dropped off at the gate of the Base. Since Skip was the Intel guy, it was his job to go out to the gate to ID the victim. This was an invitation for mortars to come raining in. Skip was in the open, visable to the enemy with no place safe to run. At this point the Base was new and unsecured. The enemy could walk right in. Needless to say, they slept prepared to defend themselves at a moment's notice. Being unprotected, as they were, there were many incidents where they were hit by mortar fire and soldiers were hurt or killed. Skip can still see their faces and how they looked before they passed. Leaving Iraq Skip was on a plane that was hit by mortars as they were leaving. The pilot was able to land them in an abandoned airfield, however, they had no ammunition to defend themelves, they had given it to the guys arriving in Iraq. They thought they had no more reason to keep it as they were headed home. It took several hours, undefended, before another plane arrived to take them home. Skip lost a lot of good soldiers, guys he knew and trained with for years. He saw things, smell things, felt things that he would not wish on his worst enemy. Those images never go away, smells bring those images back to him. Just dust kicking up reminds him of those events. Skip has PTSD and is obtaining a service dog. He needs transportation money and lodging money to St Louis for two weeks to train with his service dog. Can you help? Be sure to note Skip Beeman on the check. To be sure Skip gets your donation, please add his name to the recipient field.